Scientists were surprised to find a blood vessel resembling a reindeer while conducting an experiment. 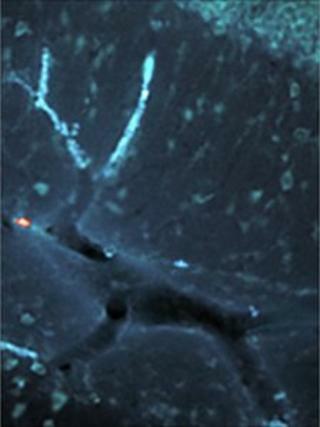 The picture, a close-up image of a blood vessel in a human brain, has the appearance of a reindeer with antlers. Even an eye and tail are visible. Newcastle University scientists were examining the inner workings of neurons when they made the festive discovery. While labelling the image, a blob resembling a reindeer's nose was added by chance, the university said. Dr Claudia Racca, of the Institute of Neuroscience at Newcastle University, who performed the experiment along with colleague Dr David Cox, said: "Biology can throw up things like this, but it was a nice surprise to find this image. "We were looking at a section of the tissue and noticed this strange but familiar shape. "It was intriguing and we noticed the similarity to a reindeer. We then took an over-exposed picture of it and the red blob for the nose and the white antlers showed up even better. "We got distracted from the science at that point and had a bit of fun with the pictures of Rudolph instead. It may not be very valuable scientifically but it looks nice on the eye."